Designed to be reliable outdoor activity essentials, perfect for year-round work or leisure wear. Storm Bloc Performance Ankle Socks are constructed with a blend of Performance Polyester and natural cotton fibres, for soft, moisture wicking socks that help to avoid blisters by keeping your feet dry and comfortable. Storm Bloc Performance Ankle Socks have terry loop cushioned feet, both for extra comfort and to help absorb impacts and fatigue, along with helpful inbuilt arch supports. 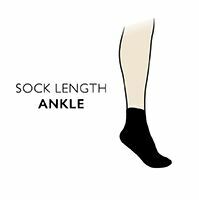 The socks have short legs that are ribbed and elasticised for hold. Storm Bloc Performance Ankle Socks come as a triple pack.